People join and leave organizations all the time, so if the person running Analytics Edge reports for you leaves, this article outlines some of the things you need to deal with. First of all, Analytics Edge products are installed and licensed on the computer they were using. License ownership is determined by the information used for the purchase, so if the email address provided during the purchase was a corporate email address, then someone from the company can request a license reset and redeploy the license to another employee/computer. If, however, the email address was a personal email address, then the license belongs to the individual, and the organization will need to purchase a new license. The reports themselves, including all the queries they used, are part of the Excel workbooks. You should secure a copy of these workbooks if you want to retain your reports. Analytics Edge has no record of any query details used. When transferring report workbooks to a different computer, Analytics Edge will be unable to run those reports without you first recreating the referenced account credentials on the new computer. See Sharing Workbooks (Account Not Found) for details. Once the accounts have been created, your reports can run as they used to. Note that any scheduled refreshes will need to be recreated on the new computer. Scheduling information is part of the Windows Task Scheduler, and is not easily transferred between computers. Analytics Edge saves security access tokens on your computer for use in refreshing workbooks. These tokens are not in the workbooks — they are on the computer itself. If an employee leaves with their computer, they leave with those security tokens. The tokens provide access to the accounts they were issued for, usually with an indefinite expiry. 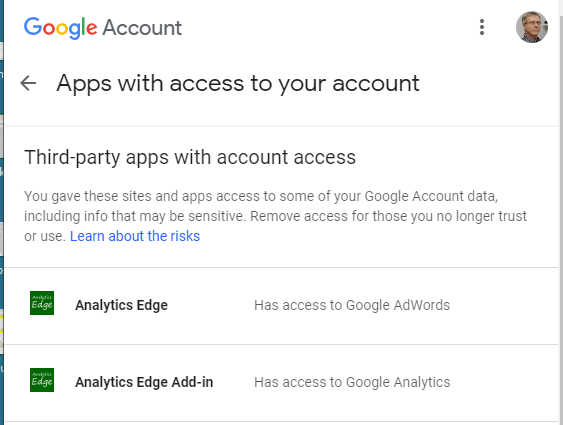 To disable those access tokens, you need to do it through the account settings for the service used (Google, Facebook, Bing, etc). These will need to be revoked to prevent unauthorized access to your accounts. Depending on the account system, these are usually part of the security settings, applications with access to your account. You may see entries for multiple Analytics Edge products, since each connector requests separate access. Note that if you revoke these access tokens, your other employees may find they need to refresh the logins for their saved accounts as well.